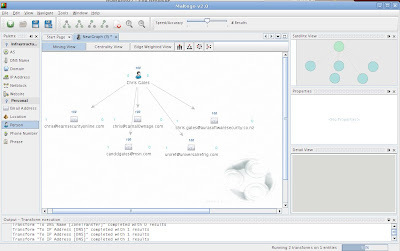 I did a previous blog post using Maltego v1 and will be talking a bit about maltego at ChicagoCon but Maltego v2 is out and its a very nice upgrade. Version 2 of Maltego has been completely rewritten - it’s a complete new code base. Population of API key integrated with license key so it’s never lost. I'm trying to tidy up slides for next week but expect a maltego post or article after chicagocon. Awesome..I am really looking forward to playing with v2. I had used v1 extensively in the past...best recon tool out there..hands down! 430 bucks is small change for what you get.